We rolled carefully up the Julian Alps on what turns out were four defected tires, my brother, his wife and my two year old niece in stow. The view from those winding cliffside roads was mesmerizing: green hills, snow capped mountains, a valley whose depth is difficult enough to absorb on one’s own and impossible for a camera lens to take in accurately. Eventually we descended from the crest of the basin into the Bohinj valley and stopped in the village of Srednja vas to stay a night before continuing our journey to Lake Bohinj and the waterfall Slap Savica further on. Srednja vas is a village of 500 with a pretty Baroque church built on medieval foundations and an unofficial gathering place under a lime tree in the center. Our lodgings were at the wonderful Apartment House Jager, where each room lead to a patio overlooking the mountains and where the owner’s son, map in hand, explained to us our dinner options as soon as we arrived. I like when they do that. “Portions are large,” he warned us. There was a place close-by with good pizza and what he considered the best restaurant in town, Gostilna Pri Hrvatu. While my sister-in-law stayed with little sleeping Lia, my brother and I set out to try the latter. To start, my brother ordered a Juha z Gobemi, a creamy mushroom soup. Slovenia is a country of avid foragers blessed with a wide variety of fung’ that grow plump and juicy in the cool, wet Alpine forests of the West. 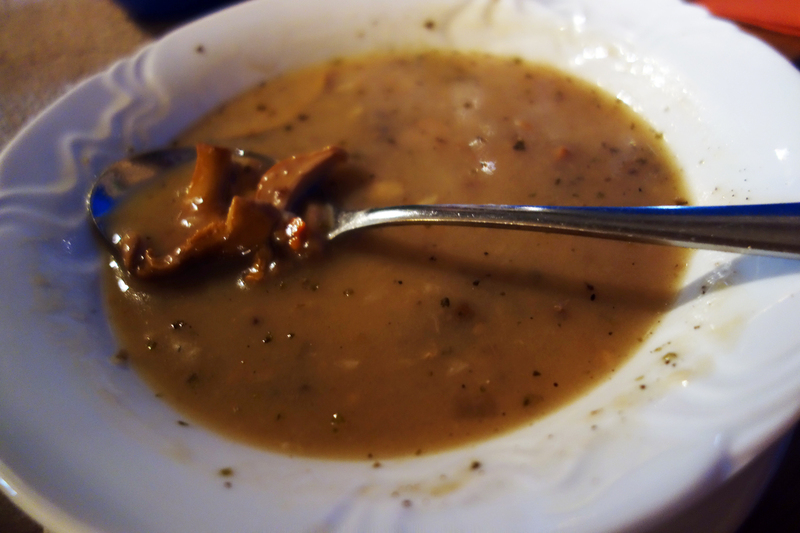 The soup was woodsy, warm and immensely comforting, seasoned with black pepper, marjoram and white wine for depth of flavor. The bowl contained a generous load of wild mushrooms, 1-2 different types surfaced each time I lifted my spoon. One of them was the boletus mushroom, especially popular in the area. They were meaty and thick but cooked until tender and easy to chew. The thick cream base of the soup was velvety smooth, rolling easily down my throat and warming me up on a cool and breezy night. Going by the recommendation of the owner I ordered the braised leg of goat, which came with a tremendously flavorful “piquant sauce” slathered all over and a side of Kruhovi smoki. This dish was by far my favorite of the entire trip to Slovenia. The goat meat was perfectly tender, cooked to a point where it nearly melted in my mouth after only one or two bites. The sauce was rich with a flavor deep enough to get lost in, which I did for the few seconds that followed my first bite. It was peppery and meaty, with a bit of garlic and onion and some red wine and vinegar (or red wine vinegar?) lingering in the background. 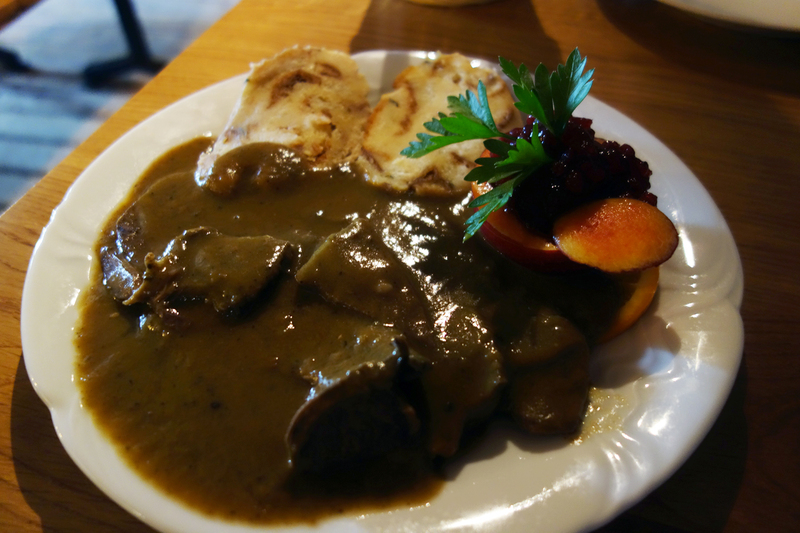 It was savory but not too salty, thick but not suffocating, like a warm blanket covering the slices of soft goat meat. I was relieved to see the Kruhovi smoki, fluffy and absorptive slices of dumpling made with day old bread and seasoned with a bit of fennel. The perfect sponge to soak up all that extra sauce and lick the plate clean with. Only the weird little garnish of peach topped with red currants was left when I was finished. We shared a mixed salad which contained green beans, brown beans, tomatoes, corn, shredded cabbage and lettuce tossed very lightly in vinegar. My brother complained that there wasn’t enough flavor. I disagreed. The tomatoes were juicy and ripe and there was a good variety of textures from all the different ingredients in there. 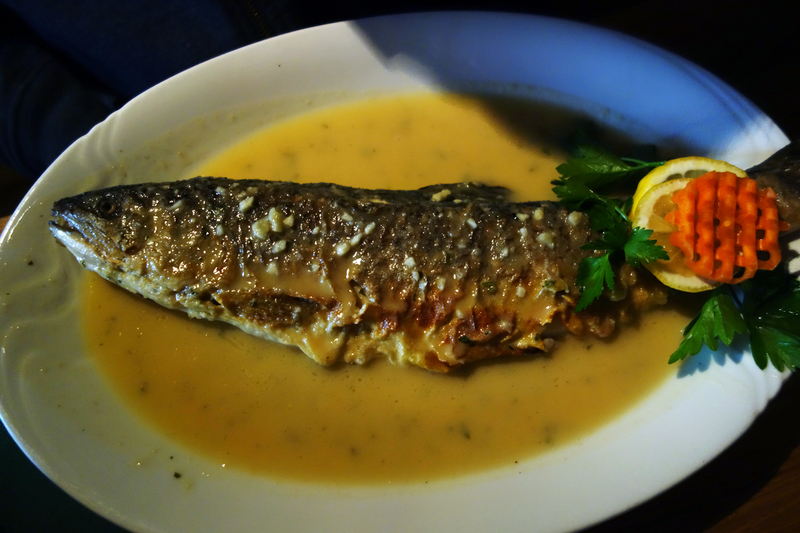 My brother chose the pan roasted trout in wine sauce, one of the four or five preparations on the menu of a fish very common to this area. The sucker was probably hooked and pulled out of the clear-as-glass water of Lake Bohinj in the valley below. As my brother sliced down the belly of the sucker, folding one half over the other and removing the spine whole, I could see bright white, slightly translucent flesh peeking forth from the browned skin. The thing was beautifully prepared, not a bit overcooked, and the meat remained slippery smooth. It had a very faint muddy flavor, a vestige of its lake dwelling past, which was checked with plenty of garlic, lemon and the wonderfully fragrant white wine butter sauce flavored also with marjoram and bay leaf. Plenty of fresh bread was provided in a basket on the side to sop up the precious sauce with. We ordered another beer and stayed a while at Pri Hrvatu, my brother and I. The owner stayed with us, sharing stories about the different tourists groups who have visited the village and eaten at his restaurant. The guy speaks German, Italian, English, Slovenian, Czech and “a little bit of French.” He apologized for his lack of fluency in Hungarian and brought us a typed up copy of his menu translated flawlessly into Hungarian. We discussed the very different definitions of “iced coffee” in the U.S. and in Europe (where it means a cold espresso with 3 scoops of ice cream, a mound of whipped cream, chocolate drizzle and sometimes even a cherry on top). He assured me that his iced coffee was for real and to prove it he brought me one, on the house. The fact that there was a sundae spoon sticking out of the thing was proof enough that it actually was not legit by my definition but I appreciated the gesture and the “coffee” ended up being a great dessert. There was even a bit of rum in there. 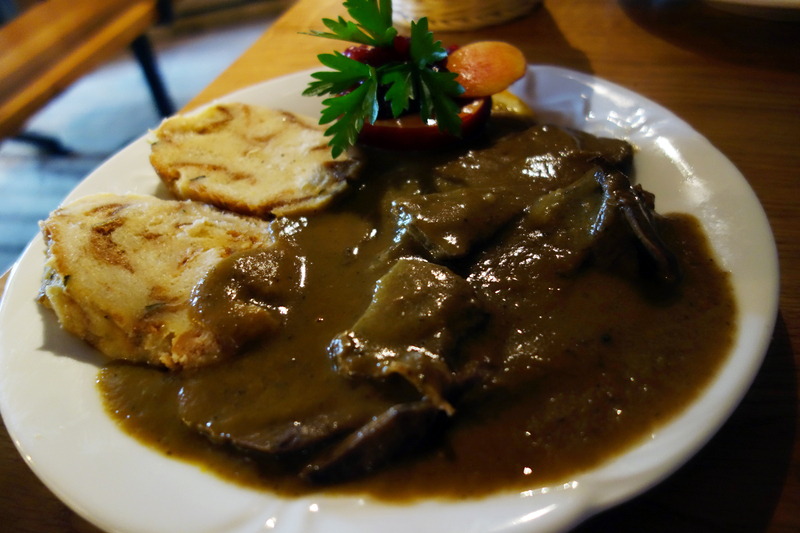 Our dinner in Srednja Vas was easily one of my favorite memories of our trip to Slovenia. A bright little gem hidden deep in the Alpine valley, surrounded by one of the most gorgeous landscapes I’ve experienced in a while, Gostilna Pri Hrvatu is a restaurant worth looking for.